I’d never really heard of the term “headspace” prior to reading Getting Things Done and Making it All Work by David Allen. In the context of getting things done, headspace relates to getting all of your to-do list items out of your head and into a system you trust. This system can be something like Trello, Google Docs, Basecamp, Podio or my favourite, a piece of paper! The key is that if you keep it all in your head, not only are you more likely to forget stuff but you become more stressed. Headspace also relates to being able to handle big decisions sensibly and not feel overwhelmed or pressured by them. I didn’t really appreciate this until I adopted the GTD system and immediately felt less stressed about work. At the time, I was a bit of a noob at Distilled and was drowning a little in my new projects. But the simple act of getting stuff onto a piece of paper and seeing all my to-do items in one place immediately made me realise it wasn’t actually that bad. I want to share a few things that I’ve picked up over the last few years which can help you free up headspace to not only feel less stressed and more relaxed, but also make you more efficient at the tasks that matter. I’m not perfect at this and my headspace is sometimes filled with the wrong stuff, but I’ve gotten much better than I used to be. Delegation is an essential part of your job regardless of headspace. Once you reach a certain level of experience, you’re going to be given more work than you can handle. At Distilled, we have a custom project management tool which gives you a nudge by telling you when you’ve got more work than you can deliver in a normal work week. This can help you (and your manager) easily see when it just isn’t practical to deliver work that you’ve been given. This system can give me the nudge I need in order to delegate some of my work so that my headspace can be cleared up a bit. Importantly, I still own the task that I delegate which means that it does take some headspace, but it’s a much smaller amount, particularly when I know I’ve given a good brief and trust the person doing the work. 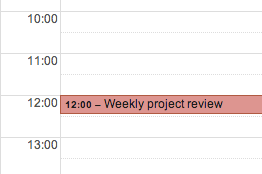 Every Friday, I take 15-20 minutes out of my day to plan the following weeks work. By doing this, I come into work Monday morning far less stressed, knowing what I need to do that day and I can get started straight away. The alternative is that I screw around trying to figure out what I’m supposed to be doing and before I know it, time has gone and it’s nearly lunchtime. We’ve all been there and know the feeling. By planning my week in advance like this, it frees up headspace to focus on what needs to be done, as opposed to having to keep stuff in my head. I’ll do a follow-up post soon explaining exactly how I use this system to keep on top of things. A key part of the process here is to use a system that you trust. I trust myself (and use triggers, see below) to make sure that I check my Trello board regularly. Having a system is pointless unless you trust it and trust yourself to check it and keep it up to date. This follows on from getting better at delegation. If those around you feel like they can take ownership of projects, problems and tasks, then they’re more likely to take stuff off your plate without you having to ask. Give people your trust and encourage them to take on tasks which may usually fall to you. Also encourage them to just get stuff done and not have to ask your “permission” to do stuff. I believe pretty strongly in letting people lead initatives on their own. If someone in my team can handle a client meeting on their own and I totally trust them, then there is often no need for me to be there – so I won’t be. The obvious benefit to me is that I can work on other tasks that do need me. The other, more important benefits for my team are that they feel trusted, empowered, become better at leading and are seen as the authority by clients. Essentially, I push them into the spotlight and don’t attempt to take it away. I’ve been doing this long enough now that I don’t really need the reminder, but I leave it there just in case and in the first few weeks it really helped me. When I found this, I joked with Ellie that it pretty much sums up my outlook on life, but then realised that it’s not really a joke! Quite often, problems will come up in the course of your work or life. The fact is that many situations are solvable somehow. Sure it may not be easy or quick, but there is always a solution – even if it doesn’t make itself known to you immediately. 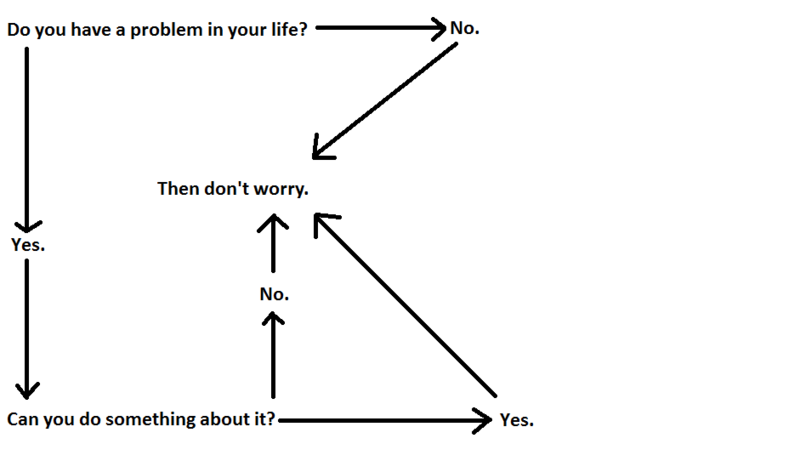 If there isn’t a solution, then why worry? I often wind up Ellie (and my mom!) because I’m laid back when it comes to problems. I can’t help it, but I’d much rather be this way inclined than have my headspace taken up by them. I’m not so good at this. As much as I love the industry I work in, it can be an incredibly bitchy one sometimes and even though it is rarely pointed directly at me, if it is directed at my friends or company, then I take it personally and I struggle to ignore it. I’ve gotten better at it recently but it does tend to take up more headspace than it deserves. I’ve started to spend less time on Twitter as a result. I used to worry that I’d miss out on stuff but the funny thing is that the truly important stuff finds itself to you. The benefit is that you don’t get all the extra noise that comes with it. Instead, learn to filter through the good and bad stuff. It will help you not get distracted by meaningless stuff.